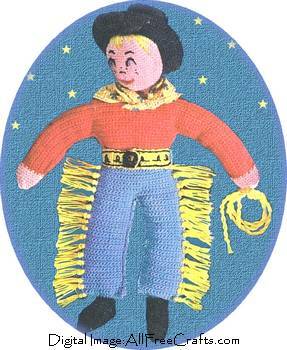 If you have any future cowboys in the family, then this could be the doll for them. Fashioned in vivid colors of Knit-Cro-Sheen this vintage crochet pattern is bright, colorful and appealing for all cowboys in the making. Since it is made almost entirely from single crochet stitch, this is also a great doll pattern for the beginner. J. & P. COATS “KNIT-CRO-SHEEN,” Art. A.64, 1 ball each of No. 70 blue Jewel, No. 123-A Flamino, No. 65 Beauty Pink, No. 12 Black and No. 10-A Canary Yellow. A scrap of yellow printed percale for scarf … Cotton batting for stuffing …A snap fastener. BODY – Front … Starting at bottom of one leg with Blue Jewel, ch 15. 1st row: Sc in 2nd ch from hook and in each ch across. Ch 1, turn. 2nd row: Sc in each sc across. Ch 1, turn. Repeat 2nd row until piece measures 4 inches. Break off. Make another piece the same way. At end of last row do not break off. Ch 1, turn. Next row: Sc in each sc across. Ch 1, turn. Repeat last row until piece measures 5½ inches in all. Break off and turn. TOP … 1st row: Attach Flamingo to first sc, sc in each sc across. Ch 1, turn. Repeat last row until Top measures 3/4 inch. Ch 29 for arm, turn. Attach a separate piece of thread to opposite end of last row, ch 28. Break off. Next row: Pick up main thread, sc in 2nd ch from hook, sc in each ch, each sc and in each ch across other arm. Ch 1, turn. Work in sc pattern until Top measures 2 inches. Break off. Work Back same as Front. Sew Back and Front pieces together, leaving opening at each arm and 1 inch open at center of last row for neck. Attach Flamingo to neck opening and sc in each sc around. Break off. HAND … 1st rnd: Attach Beauty Pink to end of arm and make 28 sc closely around. 2nd row: Sc in each sc around, decreasing 4 sc evenly around – to dec 1 sc, work off 2 sc at 1 sc. Repeat 2nd rnd until all sc’s have been worked off. Break off. Complete other hand the same way. Stuff Body firmly with cotton. HEAD … Starting at top with Beauty Pink, ch 2. 1st rnd: 7 sc in 2nd ch from hook. 2nd rnd: 2 sc in each sc around. 3rd rnd: * 2 sc in next sc (1 sc increased), sc in next sc. Repeat from * around. 4th to 7th rnds incl: Inc 7 sc evenly around. Work without increasing until Head measures 1¾ inches. Dec 5 sc evenly on next 6 rnds. Next 2 rnds: Sc in each sc around. Break off at end of last rnd. Stuff Head with cotton. Stitch ¼ inch on each side to form ears. Embroider hair with Canary Yellow. Embroider eyes with Blue Jewel and Black. Embroider nose and freckles with Black and mouth with Red. Sew Head to Body. HAT … Starting at center with Black, ch 2. Work as for Head until 5 rnds have been completed. Work without increasing until hat measures 2¼ inches. BRIM … 2 sc in eac sc around. Work without increasing until brim measures 1 inch. Join and break off. Sew Hat to Head. FOOT (make 2) … Starting at instep with Black, ch 10. 1st row: Sc in 2nd ch from hook and in each ch across. Ch 1, turn. 2nd to 10th rows incl: Sc in each sc across. Ch 1, turn. At end of 10th row, ch 10, turn; skip 9 sc, sl st in last sc. Now work in rnds as follows: 1st rnd: Sc closely around 3 sides of Instep, sc in each ch of ch 10. 2nd to 5th rnds incl: Sc in each sc around. Break off at end of 5th row. Sew across bottom. Stuff firmly with cotton. Sew to leg. BELT …Starting at narrow end with Canary Yellow, ch 8. 1st row: Sc in 2nd ch from hook andin each ch across. Ch 1, turn. 2nd row: Sc in each sc across. ch 1, turn. Repeat 2nd row until Belt is slightly longer than Cowboy’s waist. Break off. Embroider Belt with Black. Using Black double make a chain 1 inch long. Sew to Belt for buckle. Sew snap fastener to belt. Attach Blue to side of waist, ch 8, sl st at side for belt loop. Make a loop on other side. FRINGE … Cut 4 strands of Canary Yellow 3 inches long, double these strands and draw through end sc at waist below belt, draw loose ends through loop and pull up tightly. Make a Fringe in every other row alongone side. Trim ends evenly. Complete other side to correspond. LARIAT … Cut 4 strands of Canary Yellow, each 36 inches long, twist these strands tightly then double these strands and give them a twist in the opposite direction. Knot loose ends. Loop to form Lariat and sew to hand. Tie scarf around neck.